The solar farm is completed! The final step of UK Power Networks witnessing the commisioning of the protection relays went smoothly, so we threw the big switch and let the inverters fire up. Here's to a renewable future! We raised a fantastic £310,000 in the share offer - enough to proceed with the project with only a small loan for the remaining amount we need for the build. Thanks to everyone who has invested to help supply Reach with clean renewable energy! We've received lower quotes for some of the high voltage work for the solar farm, and for the civil works. This means that we won't have to raise quite as much as we thought in the share offer. We are now aiming to raise £340,000. This should be sufficient to pay for the full build cost, plus a small amount of working capital. Our stand at Reach Fair was a great success! 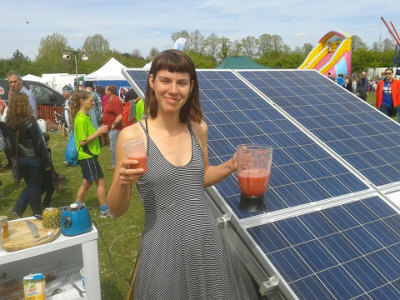 Many solar smoothies were made and enjoyed, lots of fun had (by young and old) with our solar scaletrix set, and we were able to get the word out to lots of people about the project. Thanks loads to Helen, Hugh, Wookey, Robin, Peter, Kate, Andy and Paul for all their help on the day. We're nearly halfway to the total we need to make the solar farm a reality - which is great news! It has become clear though that our original timetable for the share offer was a bit too ambitious, so we've extended it until the 31st May. More details on the share offer page. We've taken a deep breath and paid UK Power Networks a big sum to secure the grid connection for the project - today was the deadline to accept their offer. The grid connection permission allows us to export up to 200kW from the site. We've added a third way to buy shares in the solar farm - thanks to the kind folk at Microgenius. In addition to accepting cheques and paper application forms, and bank payments and website applications, you can now go to our page on the Microgenius website and sign up to make payment by Direct Debit. The advantage of using direct debit is that payment will only be taken for shares when we are ready to issue them. We're delighted to announce that we'll be launching a share offer to raise the funds to build the solar farm on 5th February at 7.30 in Reach Village Centre. All are welcome! We're working on a share offer page for the website, so watch this space - or sign up to the newsletter via the contact page if you would like to get more details by email. We've received an offer from UK Power Networks to connect up to 200kVA of export power to the electricity network. This is less than we had initially applied for, and means that we will have to scale down the size of the project by a factor of around 50%. It's possible however that we will be able to expand it again in future when the network is upgraded. We've received a letter from HMRC giving us advance assurance that shares in the Community Solar Farm should be eligible for EIS or SEIS tax reliefs. Eligibility for these tax reliefs will make investment in shares in the farm considerably more attractive for UK tax payers. Hurray! We finally have planning permission from East Cambs District Council for the site. This is a major hurdle passed - many thanks to everyone who has put in time to make it happen! It's taken a while, but our planning application is finally available online on the East Cambs Council website. Comments are welcome, and should be submitted directly to the Council. We'll be giving a short presentation about the Reach Solar Farm project at an event organised by Transition Cambridge. Other local community energy groups will also be there, including Gamlingay wind turbine and Cambridge Community Energy. More details on the transition website. The event will be at Emmanuel United Reformed Church, Cherry Hinton Road, CB1 7AJ, starting at 7.30. We've now submitted the planning application for the solar farm. As with all planning applications, the documents will be available online through the local Council website (searching for 'community-owned solar' should bring up our application). We've also put copies on our documents page. We'd welcome letters of support for the planning application - these can make a real difference to how the Council views the application. Comments can be submitted via the Council planning website, or by writing to the planning department at East Cambs District Council, The Grange, Nutholt Lane, Ely, CB7 4EE. If you have any concerns about the planning application, do please get in touch with us via the contact page - we're very happy to listen and discuss any questions you might have. We're finally registered as an Industrial and Provident Society for the Benefit of the Community. 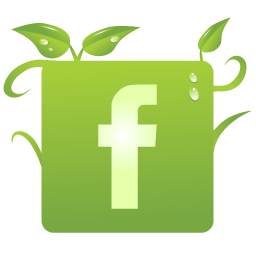 Our official title is Reach Community Solar Farm Ltd, and our company number is 32300R. You can view our registration certificate and rules. The archaeological evaluation for the site (which was needed for the planning application) was carried out as a community project. 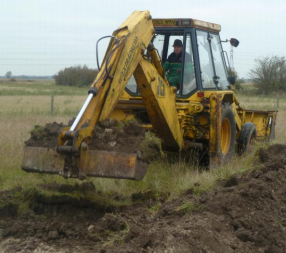 We had a great day getting muddy in the trenches which John Robinson kindly cut for us with his JCB, and found a few Mesolithic and Neolithic flints - but nothing too interesting which might have necessitated further work or prevented the solar farm going ahead. We are very grateful to everyone who assisted on the day: Jo Riches, Lily and Dylan Steed, Jon and Kathryn Cane, Charles Moseley, Veronica Wood and her sister Yvonne, Graham and Hazel Lingley, Paul and John Robinson, Andy Rankin, Kate Baker - and particularly to Claire, Tom and Sam, our team of professionals from Archaeological Solutions. Archaeological Solutions led the project for us and wrote the report without charge, which was extremely kind of them - thanks! 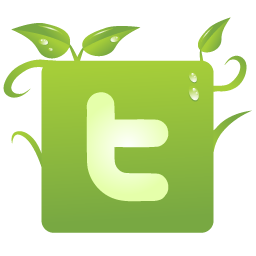 We've got our website up and running! Apologies that at the moment it is a bit sparse. We'll keep it up to date as things progress. 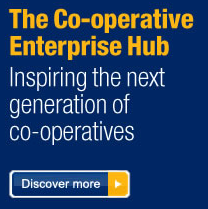 We're delighted that we have been awarded assistance starting up the Co-operative by the Co-op Enterprise Hub. We've heard back from the Council after our request for a 'Screening Opinion'. This is a document that outlines the requirements that the Council expect to be met when we submit the planning applicatiom. The Council have told us that we aren't going to have to submit a full Environmental Impact Assessment with the application. This is good news, as a full EIA is very expensive and time-consuming. However, we will have to undertake an archaeology assessment, and we will have to write a Flood Risk Assessment, as much of the land is low-lying. We held a meeting in the Village Center to start the project off. About 40 people attended - and we had a very positive response! You can view the presentation we gave here.